THE MIRRORLESS HERO BLOG: EN - Making of "A Photoblogger's Philosophy – Steve Huff in Las Vegas"
Steve posing for "A Photoblogger's Philosophy"
This ‘making of’ will start with some few personal notes. Back in 2012, when I started COSYSPEED I was already a fan of Steve’s blog for some years. I remember well that I liked his ‘real world’ approach in reviewing especially mirrorless gear. And I think he was the first one in the photo bloggospehere with such kind of reviews. Even if he uses a cool and easy language, his reviews are very precise when it comes to the major flaws and goodies. 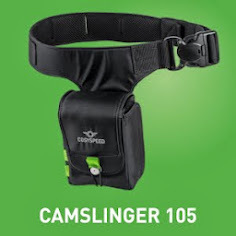 And he was somehow an inspiration for me with the development of the CAMSLINGER bags. It was my dream those days to read a review by Steve about the new bags and this dream came true in march 2014. I was so pleased that he did this review and that he liked the CAMSLINGERs. Then in October I met him and Debbie personally in Las Vegas, where my friend and filmmaker Jan Wagner shot the third release of “A Photoblogger’s Philosophy” – with Steve as protagonist! Steve and Debbie are very nice and kind guys. I just felt good when beeing with them and was enjoying their positive charisma. It was a great time and for me something came true that I never had expected only two years ago. The first Photoblopgger’s Philosophy videos we made in Berlin and Frankfurt with Chris Gampat and Thomas Leuthard. But this one should take place in Las Vegas. I know that Steve is sometimes there as there are plenty of images from the strip on his blog. So after I was in New York for a day to give a training to the great B&H sales staff, Jan and me went to sunny Las Vegas and met up with Steve. First we made an interview with him, which was absolutely interesting. Steve was talking about his feelings about photography and his blog, that is surely one of the most popular in the mirrorless world. After that we hit the streets of Las Vegas. Steve was using a pre-production model of the new CAMSLINGER 160 Paris Gray and stored his shiny new LEICA Monochrome in the bag. Attached was an old Elmarit 50 mm lens made 70 years ago. Just a few days later Steve sent some images to Jan and me and we were impressed. Great images from Steve with a certain character from this little lens. We made a second session in the afternoon and one in the morning of the next day. It was very impressive to see, how Steve approached his subjects. He tried to get in contact with the people on the street before he took a photo. It has something of telling a story and there is always a certain kind of emotions coming with Steves images. Again Jan made a very good job catching Steve while talking about photography, blogging and while taking pictures on the strip in one of the most stunning cities on this planet. Many thanks guys!